Our little ones love to play in snow. It’s been a dry year and a disappointing winter so far, with only about an inch (11 inches shy of the average for this time of year), but we’ve still managed to enjoy it. A couple of weeks ago we got half an inch, and that was enough for a fun afternoon outside. I can’t imagine how much fun we’ll have with six, eight or ten inches. There’s a big cold front coming through next week, and we have our fingers crossed. A good snowfall is one of the few things that makes winter worth suffering through. We’re going to bundle everyone up and make a day of it. 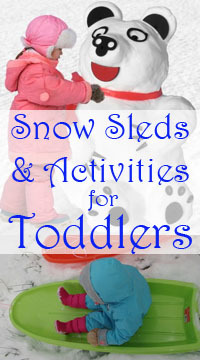 What’s the best way to entertain three toddlers in the snow? I came up with a few ideas. Yes, you could build a snowman. Ho-hum, so boring. So banal. There’s a nasty half-mud-man on our block that refused to melt and kind of ruined me for snowmen. But If I’m driving down the street and see a snow creature, now that gets my attention. 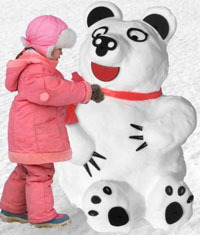 So I came across this inexpensive kit for building a snow bear. That’s what I’m talking about! All your kids really have to do is build a snow mound, and then these reusable accessories give it ears, claws, feet, and a face. What a cute idea! 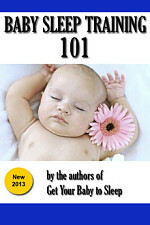 Definitely let your kids give the bear a name, but don’t let them watch him melt! Heck, you could build a whole pack of bears… one that’s too big, one that’s too small, and one that’s just right. When there’s snow on the ground, all I want to do is make snowballs. Of course, that’s a cold proposition even with a good pair of gloves, especially for the twins and our daughter. I don’t want their little fingers to freeze off! Enter one of the greatest inventions for snow play ever conceived: the Snowball Maker. This little tool is a lightweight, quick snowball compacter. It makes a perfectly round snowball in about one second — perfect for building a whole stack of them! Our kids are too little for snowball fights, but old enough to throw things at trees, or the house, or whatever. It’s only about 14″ long, so it’s not much to store. 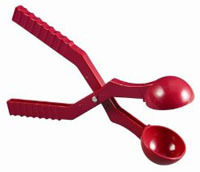 The molded handle makes it easy to grip and make snowballs (our 3-year-old is easily enough to handle it). All you have to do is add snow! Sledding, of course, is the classic snow activity. 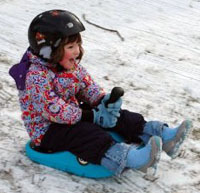 We’ve pulled our kids around on a toboggan-style sled in the backyard, and they just love it. The great thing about that activity is it doesn’t take very much snow. Eventually, though, the twins are going to want their own sleds to pull around — they’re not the best at sharing, sometimes — so I did a little bit of research. It turns out that they do make sleds for toddlers, which is a great idea. These aren’t for infants, mind you — it takes a certain amount of neck strength to sit up on most sleds because they don’t usually have back support. 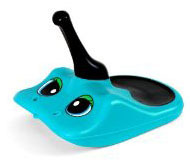 This is the “junior” version of the Zipfy sled, and it’s made for toddlers. 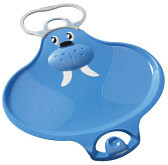 The large handle and feet-first design make this a light, durable, and safe sled option. The time to get ready for snow is before it’s even in the weather forecast. 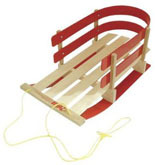 Pick up a sled or snowball maker. Check to be sure everyone’s coat and snow pants and boots still fit. Most of all, be sure to have plenty of hot chocolate!